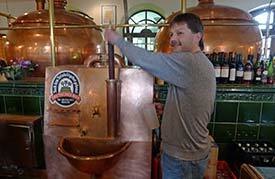 ABOVE: The brewmaster at the Brauhaus-Hotel Wittenberg tests a batch of beer. Martin Luther reportedly liked his beer, and his wife, Katharina von Bora, is said to have brewed a tasty barley pop. Today, the Lutherstadt Wittenberg brewing tradition is being carried on at the Brauhaus-Hotel Wittenberg, where you can have a drink, enjoy a meal, or spend the night above the vats. The Brauhaus occupies the Beyerhof, a restored house on the Markt in Wittenberg's Old Town that was built by Christian Beyer (then mayor of Wittenberg) in 1512. The three-story building houses the brewing apparatus, a 140-seat dining room, a number of guest rooms, and (in nice weather) a courtyard beer garden. I haven't stayed at the Brauhaus, but I had lunch there, and the meal was tasty even if the Luther-Rouladen were scorched slightly during reheating (possibly as an homage to Luther's heresies, which could have led to a fiery Auf Wiedersehen if Luther hadn't been whisked away to Wartburg Castle after being summoned to Rome). My glass of Wittenberger Dunkel was refreshing, and the dessert--a sweet pancake served with red berry compote with vanilla ice cream on the side--was superb. The dining room's atmosphere was also pleasant, with its large copper beer kettles, wooden tables, and friendly townspeople enjoying a drink or a meal. For more information, or to book a room at the Brauhaus-Hotel Wittenberg, visit www.brauhaus-wittenberg.de.